The Fort Campbell U.S. Army Base on the border of Kentucky and Tennessee is home to thousands of military personnel. When the base recently hosted a Life Support training for the National Guard, it was critical that the soldiers had access to clean and well-stocked restrooms and showers. Superior Portables worked with the training planners and the base to ensure enough restroom and shower trailers were provided and they were placed for easy access. Our team worked tirelessly to make sure the trailers were always stocked with supplies, sewage tanks were emptied and water tanks were full as some units weren't close to a water source. We made sure the portable restrooms and showers arrived on time and were removed the day after the training ended. Our GSA certification makes us a preferred vendor for US government projects and ensures the buying process is easy and prices are pre-negotiated. 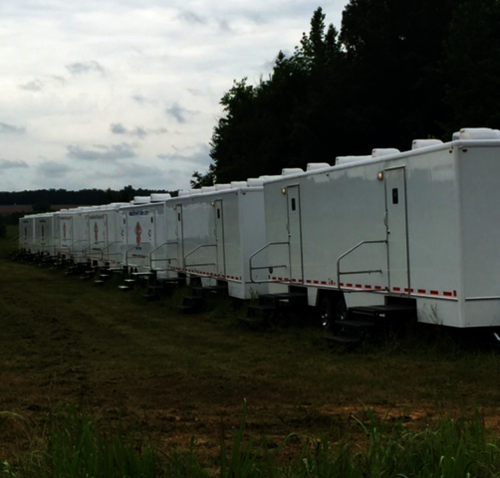 Contact us today to rent restroom and shower trailers for your government project.